4.2 out of 5 based on 82 bloggers and 7 commenters. 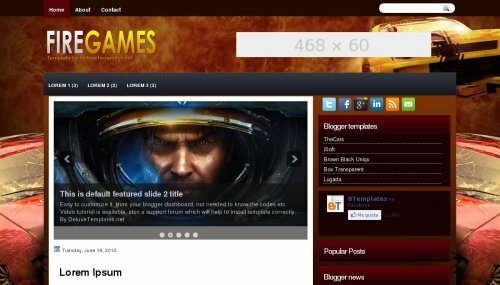 FireGames is a free blogger template with 2 columns, right sidebar, ads ready, slider, social bookmarking icons and well designed threaded comments. oooh this one is awesome, it can be used for cars blog too, nice one really ! This template can’t be modified. My slider is not working why..?